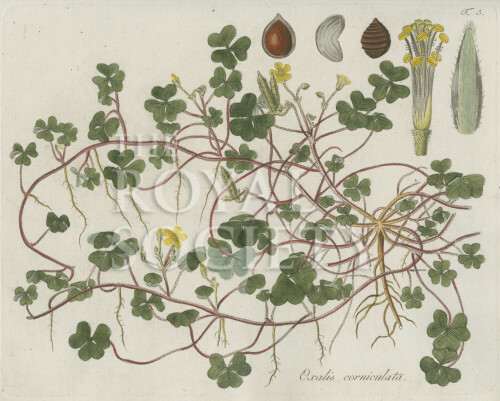 Botanical study of creeping woodsorrel [Oxalis corniculata] a plant native to Europe. This text accompanying this illustration notes: “Patria. Hispania. Italia. Graecia. Littorale astriacum. Liguria. Helive. Japonia”. The plate contains five inset details of seeds, flower bud and stamens. Plate 5 from Oxalis monographia, iconibus illustrate by Nikolaus Josef Jacquin (Vienna, 1794).